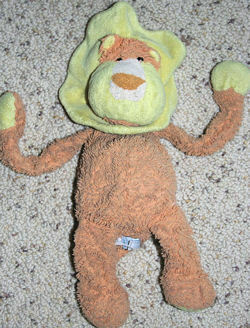 I am looking for a Baby Ganz Hugalongs Lion for my daughter as a replacement for her lovey “Lionel”. He is wearing down, and we would like to have a backup for when the inevitable day comes. We bought Lionel on my daughter’s first trip to the zoo in the Spring of 2006, before she turned one, and it was love at first sight. He has been her “best buddy” ever since, and last year she even had a “Lionel” themed birthday party. ebay #140745784944 Think this may be a newer version.